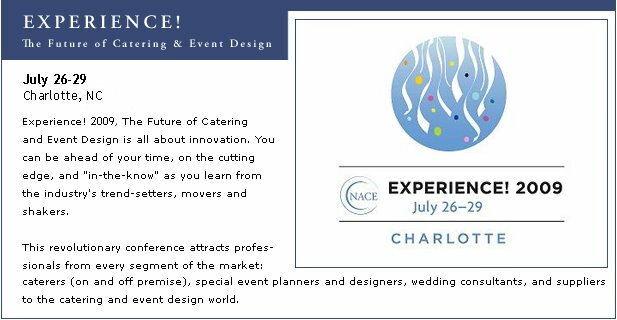 We hope you enjoy this next entry in our "Caterer Spotlight Series" featuring our very own 2008 "Las Vegas NACE Caterer of the Year", Chef Michael Napolitano of Renaissance Catering. When I was 14 I got as job as dishwasher in a Mafia owned Banquet hall in Rhode Island and fell in love with watching the cooks on the line sauteing and null and decided that is what I wanted to do. I had quit school but decided to go back to get into the Vocational Cooking Program. Once in the program I threw myself into it, placing in the top ten student chefs in the nation my senior year with null and winning a scholarship to Johnson & Whales. I turned it down, much to my parents dismay and went on to The Culinary Institute of America. Working part-time in New Jersey and New York City catering companies and taking extra classes at the International Pastry Arts School in null, NY and apprenticing in the Master Chef program. I graduated after an extended externship in Berkeley, CA at null, French pastry and truffle company. The easiest part was to get the Federal government to give us a liquor permit to serve on their property and in Arizona and Nevada! I know the question read 'this year' but this event was more interesting, at least in the off-premise world. If you could cater a private dinner, wedding or special event for someone famous, who would it be and why? $10 dollar a head wine tasting's with Free Food once a month. New menus and more exotic cooking techniques. Any words of advice for your fellow Caterers? Times are tough for everyone, but to me its a good thing and will bring everyone back to the basics and the details of events. Making people feel good thru tough times is a good way to make a living. Sorry I don't know any. I'm old school, I still read books- Heat: An Amateur's Adventures as Kitchen Slave, Line Cook, Pasta-Maker, and Apprentice to a Dante-Quoting Butcher in Tuscany by Bill Buford, My Last Supper: 50 Great Chefs and Their Final Meals / Portraits, Interviews, and Recipes, by Melanie Dunea , The Soul of a Chef: The Journey Toward Perfection by Michael Ruhlman. All great books.